Nearly 650 students received graduate degrees during Commencement ceremonies on June 5. University president, CEO, and G. Robert Witmer Jr. University Professor Joel Seligman presided, and Dean Andrew Ainslie delivered an address to the graduates. 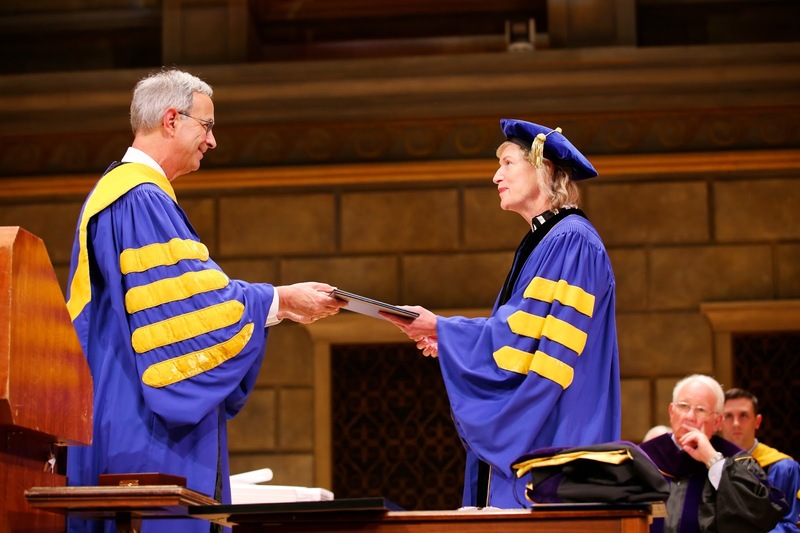 Maggie Wilderotter, former CEO and executive chair of Frontier Communications, received an honorary doctor of laws degree. 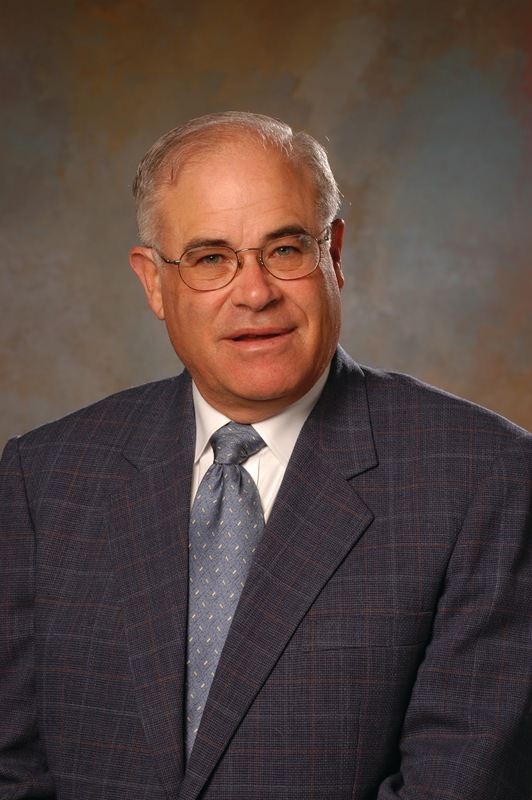 Alan Zekelman ’87S (MS), director of JMC Steel Group, also received an honorary doctor of laws degree. Zekelman leads JMC Steel Group, the largest independent tubular products manufacturer in North America. Zekelman has served on the School’s Executive Advisory Committee, National Council, and Simon Advisory Council, and was recently named a University trustee. Laurence H. Bloch ’75, P’13S, a private investor and the former chair of TransWestern Publishing Company, was awarded the Charles Force Hutchison and Marjorie Smith Hutchison Medal for his extraordinary record of achievement and service. He is a University trustee and Executive Committee member. In 2009, the Blochs were instrumental in creating the George Eastman statue to recognize Eastman’s philanthropic legacy and the launch of the University’s giving society in his honor. Pramit Jhaveri ’87S (MBA) delivered the Commencement address and became the first alumnus from India to receive the Distinguished Alumnus Award. Jhaveri is the CEO of Citi India, responsible for all Citi businesses throughout the country, comprising nearly 14,000 employees and 2.5 million customers. Jhaveri is a member of the George Eastman Circle and is a champion for Simon student recruitment. In 2015, he established a scholarship for Indian students seeking a Simon degree. 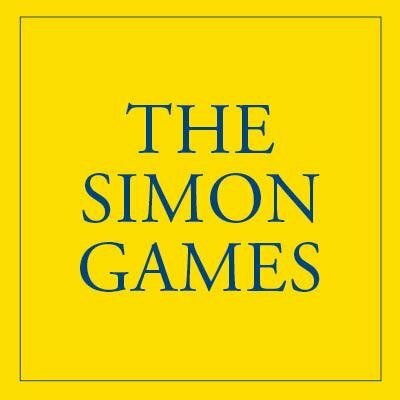 Congratulations to 2016 Simon Games winners. First place in the Part-Time category: Carter Middleton, Greater Rochester Enterprise; second place: Patrick Johnson, Enterprise Rent-A-Car; third place: David Kish, RoofMarketplace.com; and fourth place: Nick Garofoli, The Hartford Financial Services Group. In the Executive MBA category, first place: Sudhakar Sivaraj, SPX Flow Lightnin; second place: Benjamin Papp, ConServe-ARM; third place: Geoff Lawrence, Gorbel Inc.; and fourth place: Stacey Saracene, Causewave Community Partners (formerly Ad Council of Rochester). Simon Business School is ranked among the top business schools for job placement and for its Master in Finance program. U.S. News & World Report ranked Simon among the top MBA programs that lead to jobs. The April 5 U.S. News Short List focused on specific data points to help prospective students find the best graduate programs. 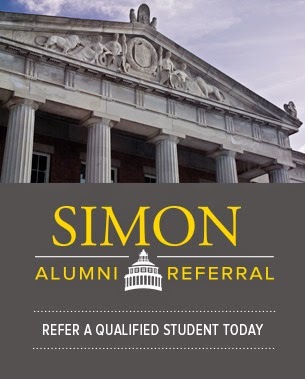 Recognized for its 96 percent placement rate three months after graduation, Simon was listed among the top MBA programs in the country for its ability to place high-quality candidates in a range of business lines and industries. The Financial Times of London counted Simon among the top five business schools in the United States for its MS in Finance program for the second year running. 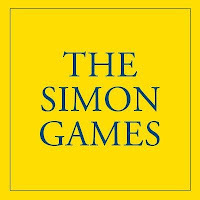 Simon is ranked 5th in the United States in this year’s survey and 39th among the top 55 MS in Finance programs in the world. Simon Business School graduates are employed by the world’s premier companies in the financial services sector at such firms as Citigroup, Credit Suisse, Deloitte, Deutsche Bank, and JPMorgan Chase & Co., among many others. Finance is the School’s leading specialized master’s program, with 69.8 percent of master’s graduates going on to work in finance and accounting. Jerold Zimmerman, professor emeritus, is a co-recipient of the American Accounting Association (AAA) PricewaterhouseCoopers Foundation 2016 Outstanding Accounting Educator Award. Zimmerman, who was recognized for his impact on the field of accounting through his groundbreaking research and teaching, has received all of the four major AAA awards for his accounting research and teaching. Prior awards include: the 2004 AAA Seminal Contribution to Accounting Literature Award, the 1979 and 1980 AICPA Notable Contribution Award, and the 1978 American Accounting Association Competitive Manuscript Award. Zimmerman’s textbooks include Accounting for Decision Making and Control, 9th ed. (McGraw-Hill, 2017), Managerial Economics and Organizational Architecture, 6th ed. with James A. Brickley and Clifford W. Smith Jr. (McGraw-Hill, 2016), and Management Accounting in a Dynamic Environment, with Cheryl McWatters (Routledge, 2016). A founding editor of the Journal of Accounting and Economics, he earned a PhD in Business Administration at the University of California, Berkeley, after completing undergraduate studies at the University of Colorado. Gerald Gitner ’68S (MBA) and his wife, Deanne, are creating the Gerald and Deanne Gitner Prize for Teaching Excellence, which honors a junior faculty member for teaching and research excellence and overall impact on the School and the University. The award is presented during Commencement ceremonies. The inaugural Gitner Prize went to professor Mitch Lovett for his exemplary teaching and research. A retired airline industry CEO, Gitner received his Simon MBA in May 2015, 47 years after attending the School. Gitner went on to become the youngest vice president in Trans World Airlines (TWA) history, later rising to CEO, and held senior-level roles at Texas International Airlines, Pan American World Airways, and Texas Air Corp. Gitner also co-founded People Express Airlines. In April, prominent executives visited the Simon Business School to deliver lectures through the Sands Lecture Series, the Ain Center for Entrepreneurship, the Frederick Kalmbach Lecture Series, and the Max Farash Lecture Series. Jim Stengel, former global marketing officer at Procter & Gamble and author of Grow: How Ideals Power Growth and Profit at the World’s Greatest Companies, spoke at Simon on April 6 as part of the annual Sands Lecture Series. Stengel explored the characteristics of top leaders and inspired students to think about leadership standards and activities, and stimulated thinking on ideals and growth. Jeff Hoffman, cofounder of Priceline.com, uBid.com, and CTI, and founder of ColorJar, presented his talk, “Keys to Success for Entrepreneurs,” on April 7. The lecture was hosted by the Ain Center for Entrepreneurship. Hoffman gave an interesting and informative glimpse into the inner workings of the online travel giant, as well as his other ventures. Leonard Schutzman, former PepsiCo senior vice president and executive professor, spoke to students on April 12, about his new book, Fast Track Up the Corporate Ladder: The 8-Step Guide to Turbo Charge Your Career. While researching the book, Schutzman spent time with C-level executives of leading companies and asked them what it takes to rise to the C-suite. They all agreed the most important factor in being a leader is multidiscipline cross-functional thinking—the ability to look at an issue from all perspectives. 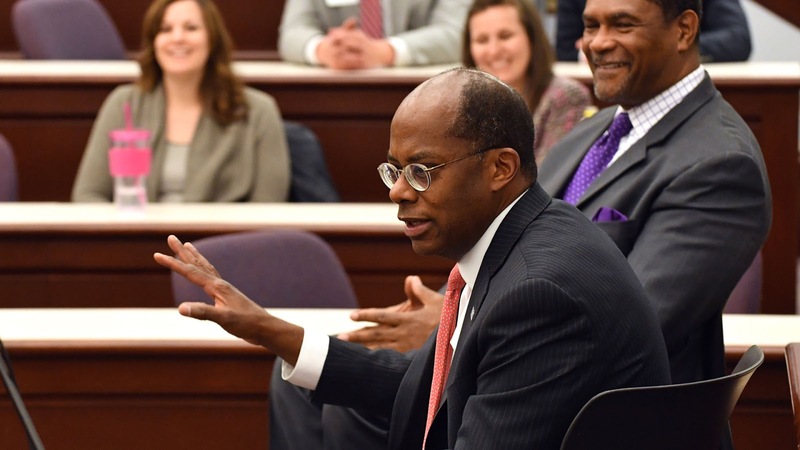 Roger W. Ferguson Jr., president and CEO of TIAA, delivered a Kalmbach Executive Lecture on April 25. As the former vice chair of the Federal Reserve Board of Governors, Ferguson was the only Fed governor in Washington, DC on 9/11. He served during the Obama administration on the President’s Council on Jobs and Competitiveness, and co-chaired the National Academy of Sciences Committee on the Long-Run Macroeconomic Effects of the Aging US Population. Maria Pereira, author and former managing director of Brown Brothers Harriman and Co., shared her perspective during a Farash Executive Series Lecture and panel discussion; the topic was “A Banker Reflects on Money, Love, and Virtue.” Joining the panel were professors Clifford W. Smith Jr., Louise and Henry Epstein Professor of Business Administration and professor of finance and economics; David Primo, Ani and Mark Gabrellian Professor and associate professor of political science and business administration; and Ed Deci, professor of psychology at the University of Rochester. Simon Business School hosted two prestigious academic conferences this past spring, bringing prominent scholars to campus from around the globe. The 16th annual Strategy and the Business Environment Conference was held at Simon Business School on April 29 and 30. The global conference, organized by professors David Primo and Mark Zupan, was sponsored by the Simon Business School, the Bradley Policy Research Center, the Department of Political Science, the W. Allen Wallis Institute of Political Economy, and the Politics and Markets Project with additional support from Christopher Dunstan ’81S (MBA) and Martin Stern ’80S (MBA). Academics from business schools around the world presented their research on public policy topics. Stern, partner at Womble Carlyle, delivered the keynote address. Daniel Blake, a member of the strategy department faculty at IE Business School in Madrid, Spain, presented his paper, “How Does Political Risk Affect Firm Performance? Evidence from Telecommunications License Cancellations in India,” with co-author Srividya Jandhyala of ESSEC Business School. “If you’re doing research like I do that’s interdisciplinary, it’s a fairly easy opportunity to get all these different perspectives in the same room,” Blake said. The semi-annual Carnegie-Rochester-New York University Conference on Public Policy welcomed prominent scholars to the Rochester campus on April 8 and 9. The theme was “Globalization in the Aftermath of the Crisis.” The Carnegie-Rochester Conference on Public Policy was initiated in the early 1970s through the efforts of the Bradley Policy Research Center at the Simon Business School and the Center for the Study of Public Policy at Carnegie Mellon University. Under the leadership of the late Karl Brunner (University of Rochester) and Allan Meltzer (Carnegie Mellon University), the conference became a semi-annual event initially occurring in April in Rochester and November in Pittsburgh. The objectives of the conferences are to stimulate policy relevance and empirical research in economic science, to encourage the exchange of scientific ideas among analysts, and to generate a greater understanding by academic economists of practitioners’ environments. Simon hosted the 4th Annual Minority Male Leadership Association Leadership Symposium, “A Tale of 2 Cities: Being Who I Want to Be (The Blueprint to Success).” The event helps combat the Rochester City School District low minority male graduation rate through educational and motivational activities. Students attended self-motivation, goal setting, and other workshops. Former NFL player Roland Williams, founder of local nonprofit Champion Academy, delivered an inspiring keynote. Nine expert educators join Simon Business School’s world-class faculty. Allyn Evans, senior lecturer of communications, taught public speaking full time at Oklahoma State University and at Northern Oklahoma College as an adjunct faculty member. She also taught marketing, business law, and career development at several colleges, including Texas Tech University. Evans has extensive communications experience, having worked with organizations including Toastmasters International, Lubbock (Tex.) Area Coalition for Literacy, Women’s Protective Services Inc., and Court Appointed Special Advocates Inc. (CASA). Evans holds a BA in Psychology with a minor in business from the University of Mississippi and an MBA with a concentration in Marketing from Texas Tech. Becky Landy, senior lecturer of communications, has been a visiting lecturer at SUNY Geneseo and an adjunct lecturer at Hilbert College, where she taught marketing and business management, as well as senior capstone classes. She is a principal at MJ Associates in Orchard Park, NY, a consultancy that helps organizations analyze, create, and execute business strategies, marketing plans, and project management, and supports economic development initiatives. Landy is also a partner at Tell Design, providing idea generation, positioning, and marketing and market research support to the toy-invention industry. Previously, she was COO at UB Business Alliance and executive director for the Center for Industrial Effectiveness at the University of Buffalo. She holds a BA in English from Colgate University and an MBA in Marketing from Clarkson University. Young Sun Lee, clinical assistant professor, communications, recently earned a PhD in Communication from Florida State University. Her dissertation topic was “How to Maximize Self-Efficacy in Health Messages: Exploring the Relationship Among Responses to Messages and Behavior-Specific Cognitions Using Self-Affirmation Theory.” Lee earned an MA in Journalism and Mass Communication and a BA in Political Science at Chung-Ang University in Seoul, South Korea. She served as a senior marketing consultant and executive researcher for The Nielsen Company in Seoul, and has taught a variety of communication courses at Florida State. Thom Shaw, clinical assistant professor of business communications and leadership, joins Simon with more than twenty years’ experience as a communications consultant and leadership coach with Kenning Associates and McKinsey & Company. Shaw advises clients on using communications to support and lead change efforts; strengthening performance of executives and change leaders; building high-performance teams; defining targeted messages; and synthesizing and presenting insights from extensive analysis. He prepares rising leaders for new responsibilities through a mix of technical and adaptive growth, building on theories of meaning-making and adult development. Shaw received a BA in English from Yale University, an MA in English and American Literature from the University of Chicago, and an MFA in Creative Writing from Emerson College. Yaron Shaposhnik is joining as assistant professor, operations management. He received his PhD in Operations Research from the Massachusetts Institute of Technology in June 2016. His research interests are in stochastic dynamic optimization with learning, data analytics, and applications of operations research, primarily in health care. Shaposhnik earned a BS in Information Systems Engineering and an MS in Industrial Engineering from Technion–Israel Institute of Technology. Giulio Trigilia, assistant professor of finance, received his PhD in Economics from Warwick University in June 2016. He obtained a Master in Economics from Collegio Carlo Alberto in 2010, and a Master in International Relations from the University of Bologna in 2009. His scholarly interests are in financial economics and information economics, with a focus on the contractual and institutional design problems facing financial markets under asymmetric information. He is also interested in the history of finance. Kent Walker, senior lecturer of communications, has taught writing courses in the English department at Brock University in St. Catharines, Canada, and was an English professor at Niagara College, St. Catharines. He also served as a professor and program coordinator in the English department at Humber Institute of Technology and Advanced Learning in Toronto. His expertise includes communications and presentation skills, collaboration, networking, team building, technology-based instruction, and program and course design and development. Walker earned a BA in English Language and Literature and an MA in English at the University of Western Ontario, and a PhD in English at York University in Toronto. Jason Xiao, assistant professor of accounting, earned his PhD from the University of Pennsylvania Wharton School in 2016. His research interests are in corporate governance, executive compensation and incentives, and disclosure. Xiao holds an MA in Statistics from Wharton, and a BS in Business Administration with a double major in Accounting and Economics from The Ohio State University. Chenyu Yang, assistant professor of economics and management, received his PhD from the University of Michigan in 2016. Yang’s fields of interest are industrial organization, innovation, and applied econometrics. His research focuses on how market structures affect innovation, product positioning, pricing, and welfare. Yang also earned a BA in Mathematics from Gustavus Adolphus College. Nearly 80 students and representatives from local businesses participated in the Career Management Center’s “Got Mock?” signature event on February 12. Eighty Simon students practiced their interviewing skills with 40 volunteers from the Rochester community. Students took part in two mock interviews, a panel discussion about career progression, a game of Job Jeopardy, and a networking reception. Will Reynolds ’10S (MBA) was featured in global media coverage of the 2016 Invictus Games, held May 8–12 in Orlando, Fla.—the first time the competition took place in the US. An injured Iraq War veteran, Reynolds served as captain of the US Invictus Games team, winning two gold medals and two silver medals in track and field events. President Obama introduced Reynolds at his Wounded Warrior Ride kickoff speech. 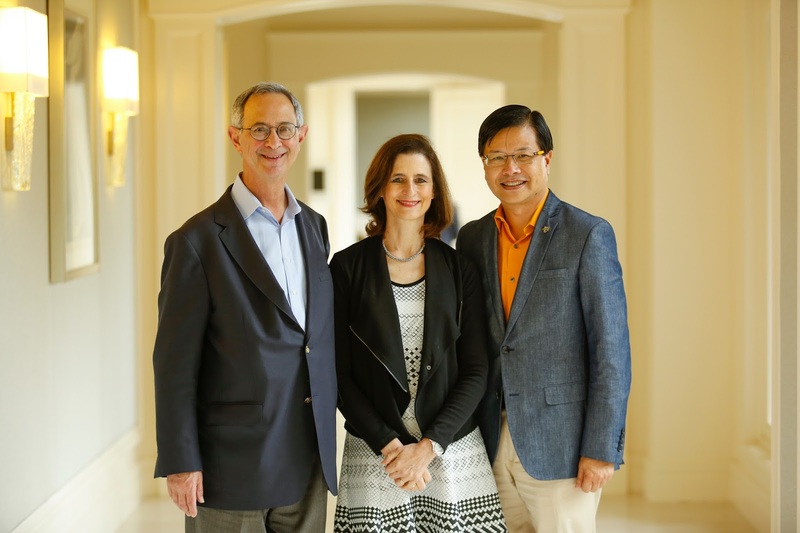 Evans Y. Lam ’83, ’84S (MBA) and his wife, Susanna, were awarded the Judge Ronald S. W. Lew Visionary Award by the Chinese American Museum as history makers for their contribution to the Chinese American community and their efforts in philanthropy. The award was presented at the museum’s 20th annual Historymakers Awards gala in September. As generous supporters of the University of Rochester and the Simon Business School, the Lams committed $1 million to the River Campus last year to establish the Evans and Susanna Lam Library Revitalization Fund. The fund supports the modernization of the patron services area in Rush Rhees Library, which is named Evans Lam Square. Lam worked at the Rush Rhees circulation desk as an undergraduate student. The Lams also endowed the Susanna and Evans Y. Lam Professorship in 2012, held by Simon faculty member Joanna S. Wu, and have supported many other University-wide faculty and student initiatives. A University of Rochester trustee and Simon National Council and Simon Advisory Council member, Evans Lam is managing director, wealth management and senior portfolio manager at UBS Financial Services Inc. in Pasadena, Calif. The Lams are charter members of the George Eastman Circle, the University’s leadership giving society. The first graduating class of UBS global wealth managers in the Rochester-Bern Master in Wealth Management program in collaboration with UBS AG received dual degrees in Zurich. Participants earned an MS in Wealth Management from the University of Rochester and a Master of Advanced Studies in Finance from the Universität Bern. Jeanine Miklos-Thal, associate professor of economics and of marketing, recently earned tenure. Miklos-Thal is a micro-economist with research interests in industrial organization, antitrust policy, marketing, and personnel economics. Her papers have appeared in leading economics and management journals including the Journal of the European Economic Association, the RAND Journal of Economics, the Economic Journal, the American Economic Journal: Microeconomics, Games and Economic Behavior, the International Journal of Industrial Organization, the Journal of Marketing Research, and Quantitative Marketing and Economics. 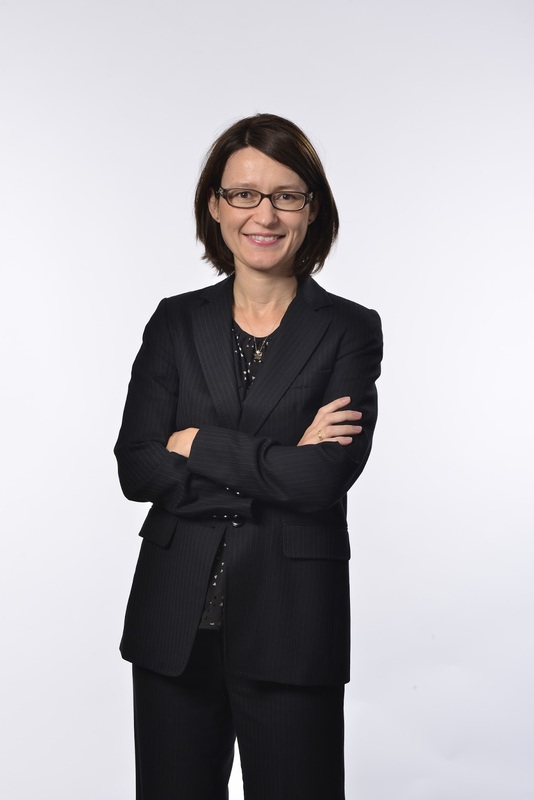 She serves as an associate editor for the European Economic Review and Management Science. Miklos-Thal teaches classes in pricing and game theory, and holds an MA in Economics from Maastricht University and a PhD in Economics from the Toulouse School of Economics. Robert Novy-Marx, the Lori and Alan S. Zekelman Professor of Business Administration, has beenJournal of Financial Economics, the Financial Analysts Journal, the American Economic Journal: Economic Policy, and the Journal of Finance, among other publications. His accolades include the 2012 Whitebox Advisors Selected Research Prize (second place); the Fama-DFA Prize for the best capital markets/asset pricing paper in the Journal of Financial Economics in 2012 and 2013; the 2012 AQR Insight Award Distinguished Paper Prize; the 2011 Smith-Breeden Prize for the best capital markets paper in the Journal of Finance; the 2011 Spangler IQAM Prize for the best paper in the Review of Finance; the 2010 Mill’s Prize for the best paper in real estate economics; the American Real Estate and Urban Economics Association Dissertation Award in 2005, and the Western Finance Association’s Trefftz Award in 2004 for “An Equilibrium Model of Investment Under Uncertainty.” His “Hot and Cold Markets” paper won the 2010 Mill’s Prize for the best paper in real estate economics. A member of the National Bureau of Economic Research, he taught at the Booth School of Business at the University of Chicago before coming to Simon Business School in 2010. He is a graduate of Swarthmore College and received his PhD from the University of California, Berkeley. 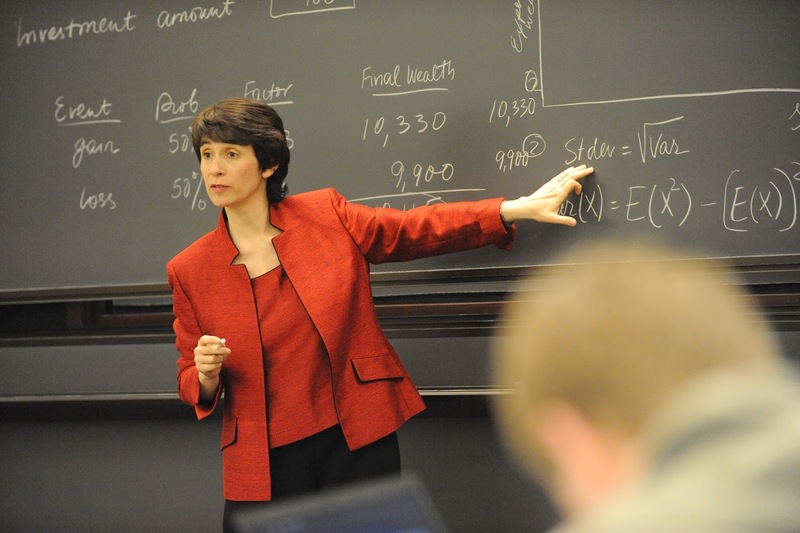 Vera Tilson, associate professor of operations management, was recently granted tenure. Tilson’s research interests include operational issues in the health care industry, project management under uncertainty, the effects of new technologies on supply chain contracts, and production and pricing decision challenges faced by producers of durable goods selling to strategic consumers. Her interest in a variety of applications led her to use diverse methodologies in her research. Tilson’s current emphasis is health care operations, in which she focuses on the construction of models that explore trade- offs in the operations problems in this setting and the structure of good solutions, as well as the creation of algorithms designed to tackle these problems. She has published articles in Management Science, Manufacturing and Service Operations Management, Operations Research, Production and Operations Management Journal, Decision Support Systems, and the European Journal of Operations Research, among others. Tilson was a co-recipient of the Superior MBA teaching award and the 2016 G. Graydon Curtis ’58 and Jane W. Curtis Award for Nontenured Faculty Teaching Excellence, and was a winner of the 2015 INFORMS Teaching Case Competition. She earned an SB in Electrical Engineering from the Massachusetts Institute of Technology, an MS in Applied Mathematics from the Colorado School of Mines, and a PhD in Operations Management from Case Western Reserve University. Vera Tilson received this year’s G. Graydon ’58 and Jane W. Curtis Award for Nontenured Faculty Teaching Excellence, established in honor of Professor Ralph Helmkamp ’11. Tilson’s honors include twice being on the Simon teaching honor roll, a co-recipient of the Superior MBA teaching award, and the 2015 INFORMS Teaching Case Competition. 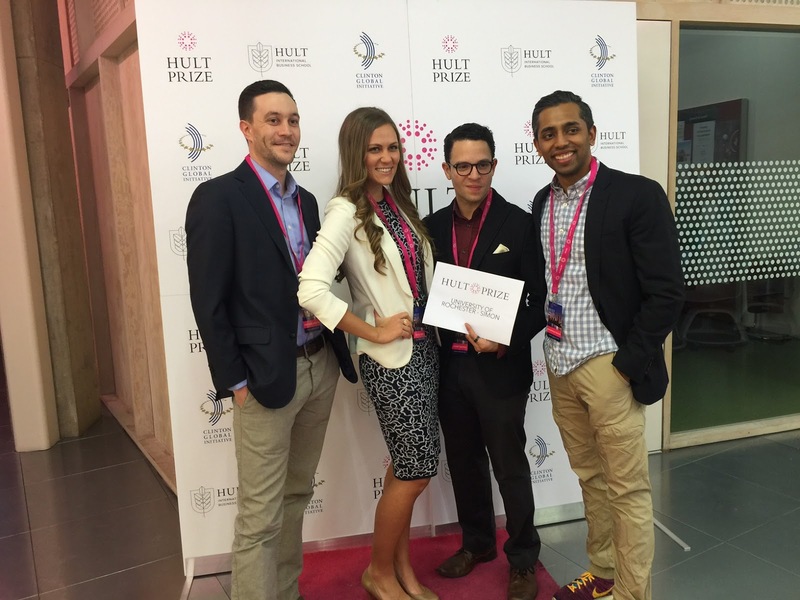 Full-Time MBA Class of 2016 graduates Mohammad Shaikh, Andre Segovia, Gregory Sheldon, Mikayla Hart competed in the regional finals for the prestigious Hult Prize in London in March. Driven by their academic experience, the team developed an innovative concept to address critical social issues of urban poverty and food insecurity. Nia Nest leverages mobile technology, banking, community organizations, and food distribution models to create a sustainable impact in Pakistan. 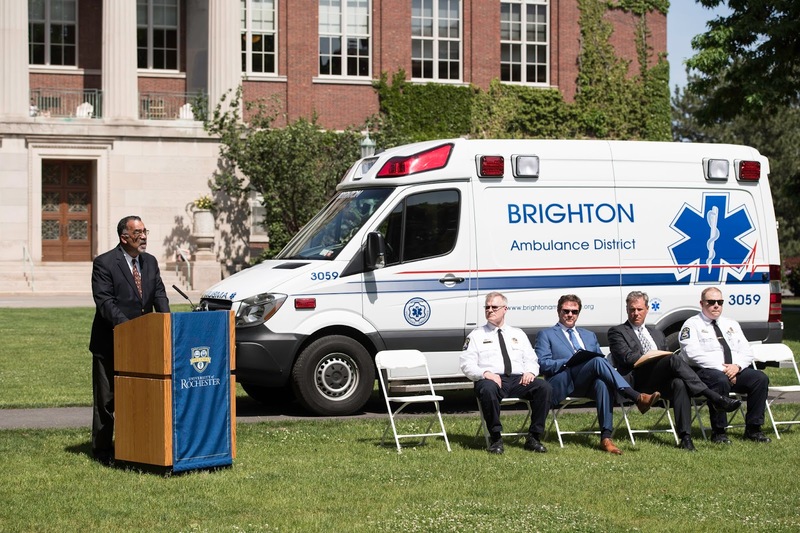 The University of Rochester community gathered in May for an ambulance dedication and Zhe (Zack) Zeng ’95, ’98S (MBA). Zeng, who was an emergency medical technician for Brighton Volunteer Ambulance (BVA) while he was a student, died helping the injured at the World Trade Center on September 11, 2001. Zeng was working at the nearby Bank of New York in lower Manhattan. When his building was evacuated, Zack ran toward the scene with as many emergency supplies as he could carry. He was last seen assisting a woman on a stretcher on the sidewalk outside the South Tower. Paul Burgett, vice president and senior advisor to the president and University dean (pictured) knew Zeng as an undergraduate student and served as emcee. Dean Andrew Ainslie and provost and senior vice president for research Robert Clark made their remarks. Members of Brighton Volunteer Ambulance were on hand to honor Zeng and give tours of the ambulance dedicated in his memory. President, CEO and G. Robert Witmer Jr. University Professor Joel Seligman welcomed Zeng’s mother, Jiao Xian Cen, his two aunts, and a cousin to the campus to see the Gleason Hall fourth-floor patio dedicated in memory of Zeng and Jeffrey R. Smith ’88S (MBA), the two Simon Business School alumni lost on 9/11. Richard (Rick) Cardot ’07S (MBA) has been named the director of the Barry Florescue Undergraduate Business program, a joint effort between Simon Business School and the University of Rochester. Under Cardot’s leadership, the University will expand its Bachelor of Science in Business and serve a growing pool of students who are interested in business careers. Since 2011, Cardot was the director of the Center for Pricing, and taught pricing strategy to both Simon and undergraduate students. Ron Carlson, previously with the Career Management Center, will now direct the Center for Pricing. First place in the Mark Ain Business Model Competition went to 0Limits, for its Everywhere Pen™, a device-neutral smartpen. MS TEAM students Facundo Ciancio, Ian Lin, Alvise Pallaro, and David Thomas won $10,000 and space in the UR Student Incubator. Second place went to StimSense for a device that measures anesthesia depth. Biomedical engineering and TEAM students Martin Gitomer, Alin Ponici, Shwe Pyie, and Jia Shi won $2,500. TEAM student Aaron Allen won third place for Endogenesis, a device for real-time cancer detection. Judges were: Mark S. Ain ’67S (MBA), Kronos Inc.; Lance Drummond ’85S (MBA), TD Canada Trust Bank; Carol Karp ’74, biotechnology industry and academia; and Nicholas Lantuh ’90S (MBA), eSentir. Three recent Simon graduates, Megan DaGraca, Mohammad Shaikh, and Gregory Sheldon, are among Poets & Quants’ Class of 2016 MBAs to Watch. Classmate Mikayla Hart appeared on an earlier list. DaGraca was a Forté Fellow; Shaikh founded Nia Nest, a food subscription service; and Sheldon plans to start a business to help alleviate poverty. Dean Andrew Ainslie’s message on the value of an MBA, which first appeared as a Simon Business cover story and video, recently received three prestigious awards for public relations excellence. The October 7 Poets & Quants Op-Ed by Dean Ainslie won the 2016 PRSA Bronze Anvil Award in the Op-Ed category, the 2016 PRSA–New Jersey chapter Pyramid Award in the Content/Op-Ed category, and the 2016 PRSA–Rochester chapter PRism Award in the corporate Op-Ed category. Duncan Moore, vice provost for entrepreneurship and Kingslake Professor of Optical Engineering, received the inaugural Catalyst Award during the Rochester Museum & Science Center STEM Awards ceremony. The award recognizes an individual or organization that develops and encourages an environment promoting innovation in science and technology or utilizing science and technology to form a lasting impact on the Greater Rochester region. Moore, who leads the University’s Ain Center for Entrepreneurship and is area coordinator of Entrepreneurship at Simon, was one of seven finalists for the award.